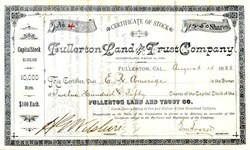 Beautiful RARE certificate from the Fullerton Land and Trust Company issued in 1888. This historic document was printed by the American Banknote Company and has an ornate border around it with a vignette of an eagle. This item has the signatures of the Company’s President, Henry G. Wilshire and Secretary. The certificate was issued to Edward R. Ameriage and signed twice by him, once on the back and once on the stock ledger stub. Henry Gaylord Wilshire (June 7 1861 - September 7, 1927) was born in Cincinnati, Ohio; attended Harvard; came to Los Angeles, California in his mid-20s; purchased land and helped turn Long Beach into a seaside resort; began to develop Wilshire Boulevard and the Los Angeles Billposting Company; became known as the millionaire socialist, publishing The challenge, which changed its name to Wilshire's magazine; contributors included George Bernard Shaw, Upton Sinclair, and Jack London. In 1895 he began developing 35 acres stretching westward from Westlake Park for an elite residential subdivision. He donated a strip of land to the city of Los Angeles for a boulevard through what was then a barley field, on the conditions that it would be named for him and that railroad lines and commercial or industrial trucking would be banned. In 1904 married Mary McReynolds; born on May 1, 1880 in New York City, New York, she was active in socialist organizations; also contributed to Wilshire's magazine; their son Logan was born on August 29, 1907; when the magazine was banned from the U.S. mail, Gaylord Wilshire published it and ran his other businesses from Canada; owned a second home in Hampstead, London, England; Gaylord stood as a congressional candidate for the 6th California district in 1890, for the British Parliament in 1894, for the Canadian Parliament in 1902, and for Congress from New York in 1904; published works include Socialism: a religion (19--), Wilshire editorials (c. 1906), and Syndicalism: what it is (1912); he died on September 7, 1927. Fullerton is a city located in northern Orange County, California, United States. As of the 2000 census, the city had a total population of 126,003. Evidence of prehistoric habitation is present in Ralph B. Clark Regional Park in the northwest of the city. Europeans first passed through the area in 1769 when Gaspar de Portolà led an expedition north to establish Mission San Gabriel Arcangel, after whom the local Native American population were dubbed the Gabrieliños. The land later became part of Rancho San Juan Cajon de Santa Ana, granted to Juan Pacifico Ontiveros, a Spanish soldier. Ontiveros began to sell parcels of the Rancho to settlers flooding California in the aftermath of the 1849 Gold Rush, including Massachusetts native Abel Stearns. In the 1860s, Stearns sold in turn to Domingo Bastanchury, a Basque shepherd. In 1886 while in the area on a duck hunting vacation, Malden brothers George and Edward Amerige, heard rumors that the California Central Railroad, a subsidiary of the Santa Fe Railway, was looking for land. Sensing opportunity, they arranged to buy 430 acres (1.7 km²) north of Anaheim for approximately $68,000. Drilling for petroleum also began in the late 1800s and fueled the first real boom, peaking in the 1920s. Construction reflected the vogue for Spanish Colonial and Italian Renaissance-inspired architecture, as in the historic Fox Fullerton Theatre (erected 1925); the home of Walter and Adella Muckenthaler, designed by Frank Benchley (erected 1924); and the city's chief landmark, the Plummer Auditorium and clock tower (erected 1930). Fullerton College was established at its present location at Chapman Avenue and Lemon Street in 1913. Meanwhile, the city banned all overnight street parking throughout the city in 1924— a law enforced to the present day. Significant public works projects were constructed during this period, including the conversion of a southwestern sewer farm into Fullerton Municipal Airport at the behest of Placentia ranchers and aviators William and Robert Dowling in 1927. Through the mid-1900s the economy shifted toward food processing rather than food production, as well as manufacturing; southeastern Fullerton became an industrial center. Val Vita Food Products (later Hunt Wesson and today part of ConAgra Foods, Inc.) began operating a citrus juice plant in western Fullerton in 1932. By 1941 it had become the largest food processing company in the US. In 1934 A.W. Leo, Tom Yates and Ralph Harrison developed the first Hawaiian Punch recipe in a converted garage in Fullerton. The city also became a producer of aerospace equipment, electrical and electronic components, navigation systems, and laboratory instruments. The first years of the 21st century have seen several political issues played out against a backdrop of class division (between the more affluent northern and western parts of the city and the southern portion of the city, which borders Anaheim), rapidly diminishing supplies of undeveloped land, and demographic changes (including the influx of Asian and Latino immigrants into an area previously dominated by Caucasians). As in many cities, growth and development are contentious issues. In the 1990s, the downtown commercial district had become economically depressed, and was known mainly for being an area of sleepy antique stores and small shops. A symbol of downtown's problems was the Fox Theatre, a local landmark, which had fallen into disrepair. As of November 2004, a fundraising drive had accumulated sufficient funds to buy the theater, but not yet enough money to restore it. By 2006, restoration was started. During this same period, the downtown area, especially south of Commonwealth Avenue, has become more of a busy entertainment district, described by the OC Weekly as "Bourbon Street West." In less than five years, some 30 businesses that sell alcohol have opened, making the downtown area much more active at night. With the festive atmosphere have come problems such as public drunkenness, fights and a shortage of parking; a police task force last year has addressed some of these problems. There is a proposal to develop the Coyote Hills area, the last undeveloped area in the city. This controversial issue has pitted local environmentalists and slow-growth activists (who argue that the city should seek state funding to buy the area and make into a park) against the pro-business and pro-growth City Council. There are also plans to build approximately 300 condominiums or apartments downtown, leading to more density. The 293-acre Hughes Aircraft Company's Ground Systems Group campus in western Fullerton was redeveloped into a major new residential and commercial district, called Amerige Heights, in 2001–2004. This development was accompanied by extreme shifts in neighborhood property values, first dropping precipitously in the late 1980s to early 1990s as the former Hughes employees sold their houses, and then rising rapidly as part of a general increase in real estate values throughout Orange County.